Madeline Smith, C'20, who along with her teammates Giselle Tolentino, C'20, and Jūratė Reventas, C'20, took first place in the 16th annual Robert 'Bob' Fram CSI Challenge on March 23, succinctly summed up the event: “The CSI Challenge allows us the opportunity to learn new skills, bond with others and win one for the Mount.” Twenty-two teams from Mount St. Mary's University, Towson University, Montgomery College, and Guelph Humber University in Toronto, Canada, competed this year. Participating in the CSI Challenge as judges and witnesses are local crime scene technicians, other law enforcement officers and faculty members from the various universities who have had experience in crime scene investigations, forensics and anthropology. This year students also had the opportunity to meet two FBI intelligence analysts to discuss how data assists law enforcement in solving crimes. Student competitors are dispatched to a replicated crime scene of an actual case to fully investigate that crime. 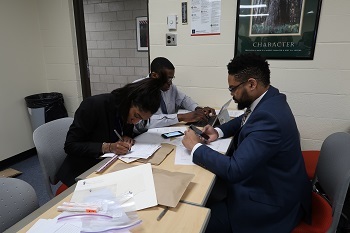 Team members are judged on their display of professionalism, expertise in crime scene evidence collection and preservation, written case preparation and interviewing witnesses, critical thinking and team coordination as they process their designated crime scene. 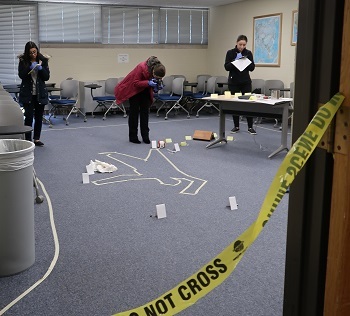 Students are given 50 minutes at the crime scene and 40 minutes to write their reports, resulting in a grueling competition. 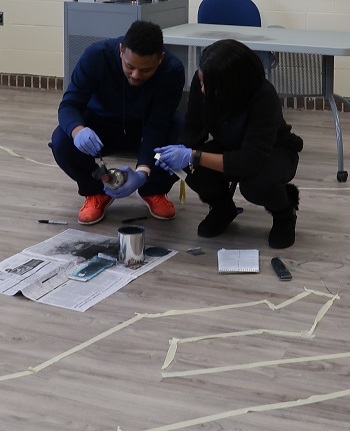 During the 50-minute crime scene investigation, three-member teams process the crime scene by photographing, sketching, collecting DNA and fingerprints, preserving blood stains, gathering shell casings and accumulating other crime scene evidence. When the evidence is collected, it must be properly submitted and a crime narrative report prepared within 40 minutes. Teams are judged by detectives of the Frederick Police Department’s Criminal Investigative Unit, forensics and crime scene technicians. 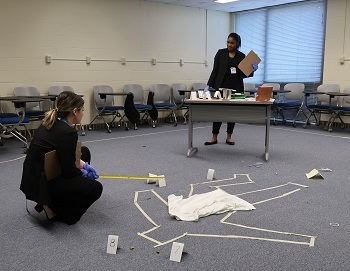 This year’s replicated crime scene was based on an actual murder investigation conducted by the Arlington County Police Department in Virginia. At the conclusion of the competition, students learned first-hand how the case was investigated and solved from the officers themselves. Officers Tara Crider and Bridget Meyer of the Arlington Police Department outlined the investigation step-by-step to its successful prosecution. The students learned that an estranged husband brutally murdered his ex-wife and staged a burglary to hide his nefarious deed. The forensic evidence uncovered at the scene proved pivotal in identifying the husband as the perpetrator as well as gaining a guilty verdict. Mount student Amani Jones, C'21, gained confidence by participating in the event. “Maybe I can do this for real," she said. "Maybe I can use these skills that I’m learning and the information that I gather and figure out how real things like this work." Mount seniors Colby Jews, Krysten Peterson and Drew Bonner of Team Alpha, who finised in fifth place, have competed for four years and are preparing for further study or employment. Peterson has been offered a position at Xcelerate Solutions, while Bonner will be entering a Ph.D. program in sociology at George Mason University. Jews recently interviewed at Xcelerate Solutions and is also considering options with local law encorcement agencies. The names, team members and scores for the top-finishing teams follow. The first-place team earned a $500 cash prize and the permanent engraving of their names on the CSI Excellence Cup. The second place team received $250 and the third place team $150.